It was the hot trade on Wall Street, a seemingly sure thing that lulled everyone from hedge fund managers to small-time investors. Now newfangled investments linked to volatility in the stock market -- until a few years ago, obscure niche products -- have exploded in spectacular fashion. The shock waves have only just begun. How these investments proliferated is a classic story of Wall Street salesmanship and old-fashioned greed. In a few short years, financial engineering transformed expectations about the ups and downs of the stock market into an asset class that could be marketed and sold -- as tradable as stocks but, it turns out, sometimes far riskier. Call it the volatility-financial complex. All told, financial players have created more than $8 billion of products tied to one index alone. In a low-interest-rate world, investors desperate for returns snapped them up, and bankers collected fees along the way. But, as with mortgage investments a decade ago, complacency -- in this case, over a history-defying period of market calm -- masked potential dangers. No one is saying the wild swings of late presage a broad collapse like the one that hit in 2008. But the fallout nonetheless provides a glimpse into the myriad products, and growing complexity, driving global markets a decade after the last debacle. The risks, in hindsight, were clear enough even before the Dow Jones industrial average plummeted nearly 1,600 points on Monday, snapped back, and then took a wild bungee jump of nearly 1,200 points Tuesday. The chief executive officer of Barclays Plc, which pioneered notes linked to U.S. market volatility, warned only last month that investors might be losing their heads. “If this thing turns, hold on to your hat,” Jes Staley told a panel at the World Economic Forum in Davos, Switzerland. Now, hats have been blown off by a whirlwind the likes of which Wall Street has never seen. To some, the volatility complex feels like a monster that’s been lurking in the shadows. Even one of the inventors of the VIX, Devesh Shah, is perplexed why these products exist in the first place. Adding to the angst is the sobering fact that neither market strategists nor money managers nor bankers who’ve structured these products are quite sure just how big and pervasive the market is. This is, of course, the way finance has always worked. Dream up the next big thing -- in this case products tied to a measure of volatility about 25 years old -- and collect fees for selling it to investors. For the banks that made a market in these instruments, there was money to be made. Exactly how much or the amount they sold is difficult to know. Barclays was the first to sell exchange traded notes linked to U.S. volatility. 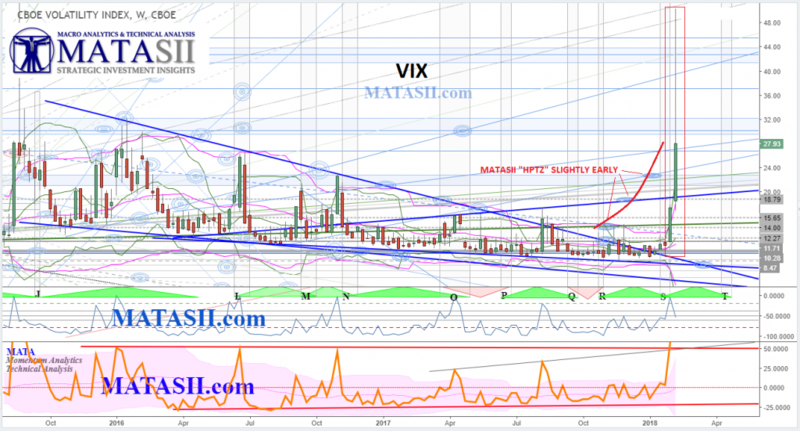 They’re known in financial circles by their ticker, VXX. Barclays veteran Nick Cherney was a close follower when he founded VelocityShares. Credit Suisse Group AG emerged as one of the largest issuers of the firm’s ETNs, followed by UBS Group AG. Citigroup Inc. also keeps a presence in the market. The meltdown began last week when stocks started to plunge and volatility spiked to levels not seen since 2015. The VIX -- officially, the Cboe Volatility Index -- surged to 50 on Tuesday, before dropping to 30. The index was started by the Chicago-based exchange. It’s too soon to know the extent of the damage. Credit Suisse’s insistence that redeeming the VelocityShares note won’t have an impact makes it harder to predict how other banks will fare. Potential losses will likely come down to how Wall Street managed their exposure to the products, which they typically hedge in the futures market. In addition to the exchange-traded products, banks have issued multitudes of other products that trade over the counter, or are considered buy and hold investments, such as structured notes. Many are linked to proprietary indexes. And while structured notes, often sold to mom and pop investors, are nowhere near the business they were before Lehman Brothers Holdings Inc. collapsed, they’re still controversial. One thing is sure: The market is big. Products that are directly linked to the VIX may manage as much as $8 billion, according to Societe Generale estimates. 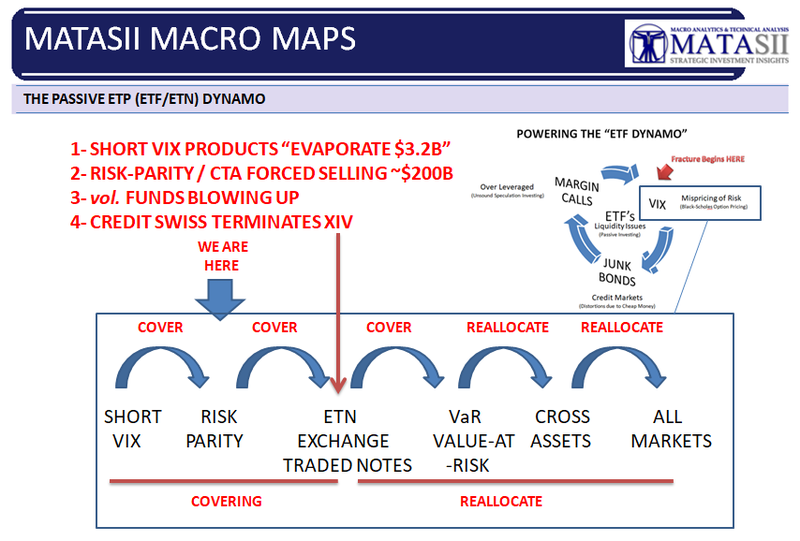 Some ETPs are long the gauge, others short it. 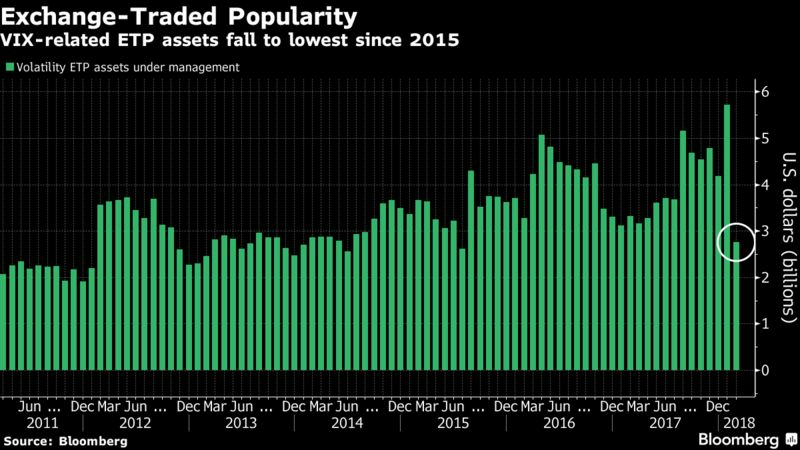 The short volatility products outstripped their bullish brethren as the more popular category at the tail end of 2017, the first time it did so in nearly two years. 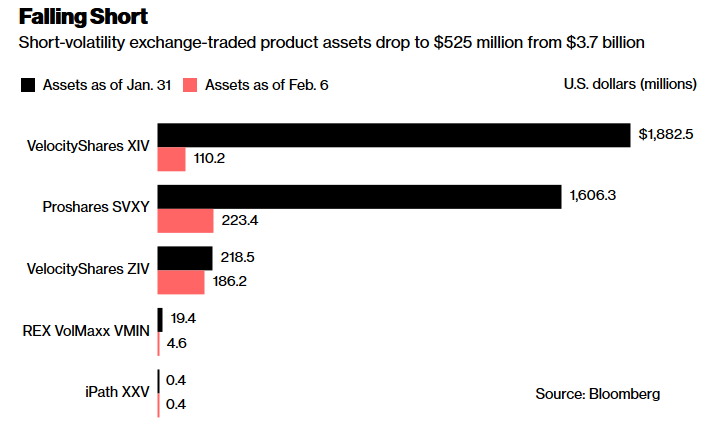 Now, assets have bled from short-volatility ETPs, down to $525 million from a record $3.7 billion in January. Including long-volatility funds, assets total $2.8 billion.